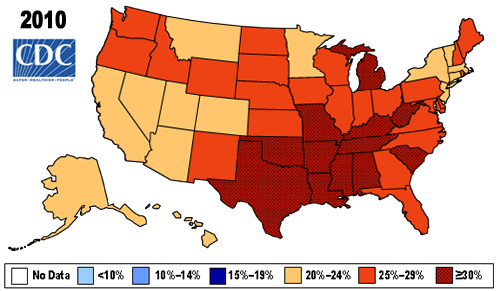 About one-third of U.S. adults (33.8%) are obese. Link to animated map that below shows the United States obesity prevalence from 1985 through 2010. The data shown in these maps were collected through the CDC's Behavioral Risk Factor Surveillance System (BRFSS), on the basis of self-reported weight and height. Each year, state health departments use standard procedures to collect data through a series of monthly telephone interviews with U.S. adults. Prevalence estimates generated for the maps may vary slightly from those generated for the states by the BRFSS as slightly different analytic methods are used. Combining county-level estimates for obesity, diagnosed diabetes, and leisure time physical inactivity for 2008 show that counties with high levels of all three conditions are primarily concentrated in the South and Appalachia, while counties with low levels of all three conditions are primarily concentrated in the Northeast and West.